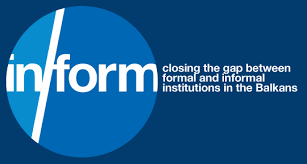 INFORM is an international three-year research project that studies the interactions between formal and informal institutions in the Western Balkan societies, as well as tracks the influence of these institutions on the implementation of the European Union rules and regulations. In the first project newsletter, INFORM highlight the goals of the project and share some first research results. The main premise of the INFORM project is that the gap between formal institutions and informal practices in the Balkans has been widening. The case studies presented in the first newsletter demonstrate some of the economic, political and social practices that bring this process to light. You can follow the INFORM project on Facebook, Twitter and YouTube. News: INFORM has just released its first Newsletter!